Driving this morning, I saw a young mother pushing a stroller in one hand, while using the other to assist an elderly gentleman using a walker. He appeared a little confused when the light changed, and kept trying to cross the busy road diagonally, instead of in the crosswalk. She was trying to keep them all from being hit by oncoming traffic. I pulled over and rolled down my window. Want some help? I asked. I parked my car and jumped out. Her son was in his stroller at the sidewalk as she tried to redirect the man with the walker from traffic. I pulled the stroller safely onto the sidewalk and sat with her little boy. I stayed while his mom tried to guide the man back and dial her cellphone at the same time, but he was determined. She finally crossed the street with him. The two of them sat on a bench on the other side of the road, four lanes of traffic between us. She was on the phone but holding the man’s hand. She kept on eye on me, too, between cars. The little boy’s brown eyes lit up when I started singing The Wheels On The Bus, and we pointed at a bus, then each big truck rumbling down the road. I went through my entire preschool song repertoire. We saw a cement mixer spinning, and a long red fire truck. We finally heard sirens and saw two police cars with their lights flashing. I showed the little boy how to make my car lights flash like theirs with the key transmitter. Ah, the distracting power of electronics. He loved it. Once help arrived, the mom made her way back across to me and her toddler, whose name, I learned, was Milo. Her big brown eyes matched her son’s. No wonder I hadn’t guessed Milo’s name as he and I went through every name I could think of, laughing with him at all my wrong guesses. It turns out the man was not his granddad, she told me. He wasn’t a neighbor or friend. He was a stranger she saw stumble in the grocery store parking lot. She’d gotten out of her car to help him to his feet, then to the bus stop when he said that’s where he was headed. He could not remember his next destination. The police had finally gotten his information from his wallet and were taking him to safety. She was a little shaken. She hugged me tightly, whispering thanks as she looked down at her precious, oblivious, happy toddler. She said I was her guardian angel. I hugged her back, and told her she’d beaten me to the guardian angel job by a mile today! That forgetful, forgotten gentleman could have been our own parent or grandparent, or even, someday, we nodded, us. She laughed when I told her I wouldn’t have been there at just that moment if I hadn’t been forgetful, too. 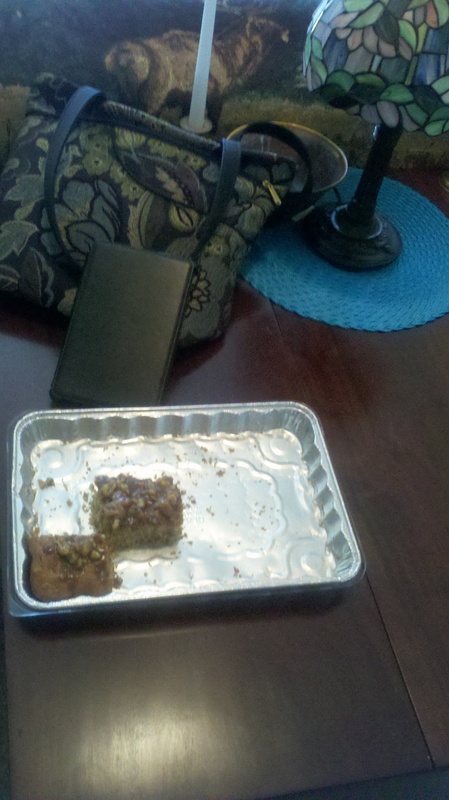 I’d left my homemade Bananas Foster cake for book club on my kitchen counter and had driven back to get it. My forgetfulness made me arrive at that precise intersection at just the same moment that they did. She just happened to park in exactly the right spot at the grocery store to see the older gentleman with the walker stumble. What providential timing. We were both in the right wrong place at the right wrong time. ♥ Bless you, Milo’s Mommy, wherever you are.